If you have the type of Halogen cooker with a lid that needs to be taken completely off and you are not very confident about lifting it gently and placing on the somewhat flimsy lid-stands provided, especially as they are prone to go skidding around the worktop, a handy hint – use the grill tray rack from your ordinary cooker! The Lid tends to get the worst of the stuck on grease as it is right next to the element which can bake it on. Whenever you take off the lid , give it a wipe with a wet cloth, this is enough to reduce the problem to manageable levels. When you consider cleaning a conventional oven though, with the chemicals… it makes the halogen lid look easy! Before Buying a Halogen Cooker consider the Height of the unit on your worktop, make sure you can lift off the lid under your kitchen cabinets. Most of the cookers we reviewed were around 25 cm tall , but you need to get the lid off easily, especially when its hot. Always use the extender ring. Although not always provided, the ring is a great accessory and well worth buying. The extra height will help protect the halogen bulb from cooking splatter. It is often very difficult to clean, so it’s a great tip, for more consistent results. You may have to slightly increase the cooking time , but since these ovens are so efficient it is still worth doing as it may extend the elements life long term. For virtually all cooking in the Halogen Oven you can use a circular cooking tray lined with silver foil . If it’s the only dish being cooked at that time , its best placed on the lower wire stand, rather than putting food in the bottom of the glass bowl. This allows the hot air to circulate under the cooking tray, avoiding the need to turn the food over halfway, for most foods ( with a whole chicken it is still better to turn , starting upside down ) and almost completely avoids having to clean the glass bowl. For example when cooking a chicken or joint in the cooking tray all the fat remains in the tray, hence reducing the mess on the bowl. The Halogen is probably the most healthy way to cook meat and chicken, the results are first class and the percentage of remaining fat in the food after cooking is the lowest. When you have finished cooking bacon, take the food out immediately, I have noticed that if you leave it in even a few seconds too long after heating, you lose that wonderful crispness, it will go soft very quickly if delayed. If you obtain two cake cooling trays (28 mm) and place one on the stand, it will prevent smaller food items from falling through. If you are cooking bacon, the second one may be placed on the top of the food and this prevents it from curling up. I agree and I eventually found a bowl with a lip that could be safely lifted out using the tongs that are commonly bundled with halogen ovens. Reheating – always be careful to get leftovers hot throughout. don’t reheat it more than once and be especially careful with chicken. Usually if I’m having chicken leftovers I’ll serve it cold the day after only ( on day 3 Chicken should not be eaten ), don’t give those nasty bacteria time to multiply. Although it will take a little longer to cook, I use the extender ring a lot, when I cook anything that splatters a lot. During cooking I’ll also take an opportunity, when turning meat over for instance , to do a quick wipe round the heater top with a wet cloth. I am new to cooking with a halogen oven. The first time I cooked a ham and it came out great. Then I tried a quiche. I lower the temperature to as you said but it would not cook completely. I did use the extender ring so it would be easier to remove from the oven. The first time I went to take it out it was still runny inside so I put the temperature up to 300 and cooked it longer. I finally had to place it in the oven for about 10 minutes. Last night I was making some scalloped potatoes and prepared it like the box said. I put the temperature at 375 and set it for 20 minutes. It was not done. I raised the temperature to 400 and cooked it about 10 minutes longer but it still was runny. I finally put it in the oven for about 10 minutes. What am I doing wrong? Have you placed the dish on a wire rack? It needs the hot air to flow round the dish, completely. When it is sitting On the base of the bowl it will produce this uneven cooking effect. Yes you can even out the cooking by partially covering thin parts like legs ( chicken ) or stop the top burning. It has to be done quite firmly though, as the fan is very powerful, compared to a fan oven. 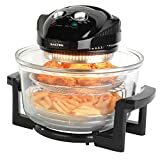 Can a halogen oven replace a microwave which I only use for reheating food? You can use anything that is approved for an ordinary cooker, ie. will withstand the heat. Some plastics can give off low levels of fumes, so I personally don’t use anything plastic. I am even hesitant to put ready meals in their original plastic containers in the microwave, even though the makers assure us that it is safe! On this Secura model, the locking mechanism is operated by a downward press on the button, on the Andrew James model it is pushed to the right to unlock. Can I use my glass plate from my microwave in my halogen cooker? You can do anything in a halogen that you can in a conventional oven, so yes I suppose you can use a microwave glass plate. My glass bowl for my rapid wave oven broke. Is there a similar pyrex bowl on the market that I can use in it’s place? Absolutely Yes! The halogen is perfect for reheating. Unlike the microwave, it won’t ruin things like chips or pastry. Hi. Is it safe to use those circular perforated baking sheets in the halogen? I’m afraid that they may catch fire? Well , as I’ve said before, anything you can use in a normal oven will be ok in a halogen. BUT the high speed wind can be a problem with paper. If you can hold it down with something, then its probably going to be ok. Just keep an eye on it when you begin. can you cook directly in the bottom of the glass bowl without a rack? Like a vegetable and beef stew? Yes I believe you can but I don’t. To cook evenly it needs to be able to circulate the air all around it. If you really want to try it ( I think I saw a good UTube demo ) then preheat the halogen oven thoroughly first, and stir often. Good evening we have been told that Halogen Bulbs are outlawed in the EU so I have a halogen convection oven what do I use? Could you give me full details please, who and in what capacity, told you this? Which Halogen oven do you have? My halogen has started to be covered in condensation during cooking, leaving a puddle in the bottom. I am using a rack in the bottom and the extender ring for slower cooking. What is wrong please? With the oven empty and completely dry, turn it on , as if you are pre-heating it. If it still condenses, the water has somehow pooled in the heater. Check if it has been taken apart and put together incorrectly, if there are gaps, showing where you would expect a seal…. that sort of thing. Not a question but a little tip. if you are using the lid stand to cool the lid of your halogen and its your first experience with using one, go through a few practice runs, with oven gloves or mitts on until you feel comfortable about transferring the lid from the oven to the stand. The reason I advise this is that time spent practicing this maneuver will make it easier to transfer the lid to the stand without the stand slipping unexpectedly. otherwise, as advised in the article, use a grill stand for the lid instead. Yes, I often open the cooker to , for example turn my chicken over. The glass bowl construction of Halogen cookers offers a great view of the state of your cooking so can keep an eye on it and stop just at the right point – browned to perfection! I live in the EU (Spain) and have a halogen oven (Fussion brand) that’s an extra cooking accessory I bought to use with the Fussion electric pressure cooker. You can also buy halogen lamps and bulbs with no problem here. So I can say that halogen bulbs and ovens are definitely not banned in the EU.